For the last 20 years, CTG has had the good fortune to work with and learn from hundreds of government practitioners. This opportunity has also extended to students in the classrooms of the University at Albany. Every year for the last 12 years as part of the nationally ranked program (ranked 3rd by US News and World Reports) in Government Information Strategy and Management, offered by the Public Administration and Policy Department, Rockefeller College of Public Affairs and Policy, Theresa Pardo has taught Building a Case for IT in the Public Sector. This course, designed as a service-learning experience, brings together UAlbany graduate students, many with the goal of leading public programs, with working government professionals to help solve real-life problems facing government and non-profit agencies in NYS. The course was developed to prepare students for the responsibilities that they, as future leaders, will have in ensuring that information and technology are used innovatively—but also effectively and efficiently, in support of public priorities. Lectures, readings and case work in the class are designed to build necessary understanding about how information and technology is deeply embedded in every aspect of government and to appreciate the role they will play as future leaders in ensuring that government investments in IT deliver value to citizens. 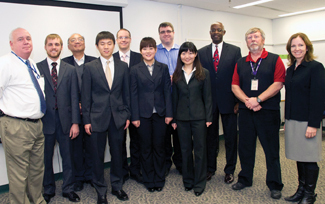 A team of students from Theresa Pardo’s PAD650 2011 class presented recommendations to New York State Acting CIO Dr. Daniel C. Chan and CIOs from several state agencies on two emerging information technology issues: 1) cloud computing and 2) bring-you-own-device (BYOD). explore work processes, organizational procedures and practices, along with the broader and dynamic economic and policy context. Using CTG’s flagship method Making Smart IT Choices: Understanding Value and Risk in Government IT Investments, Pardo teaches students how to get at the problem, identify stakeholders, and to work with colleagues from government agencies to understand the relative merit of any one approach to solving the defined problem through innovations in policy, technology, and management. Over the years students have rated the course highly; consistently identifying the chance to work directly with government practitioners as the most exciting aspect of the course and a highlight of their program. In addition to readings and lectures on IT innovation in the public sector, students learn and use techniques to manage groups, identify and analyze problems, explore solutions in terms of stakeholder interests, and public value creation. Students conduct best or current practice reviews and work collaboratively with their agency partners to develop new models, methods, prototypes, and recommendations. The class ends with a final presentation and written report back to the sponsoring agency leadership. Since the inception of the course, students have engaged with a variety of state agencies including: the NYS Office of the Chief Information Officer, Governor’s Office of Employee Relations, Department of Tax and Finance, Department of Health, Division of Motor Vehicles, Office of Children and Family Services, Office of the State Comptroller, Department of Correctional Services, New York State Police and The Capital District Library Council. Projects have ranged from understanding the implications of ‘going paperless’ to dealing with electronic records in the financial market and health arenas. Students have created recommendations and decision making tools for the state related to the use of social media, bring-your-own device policies, and cloud computing options. UAlbany Government Information Strategy and Management PAD students presented open data posters at the 6th Annual International Conference on Theory and Practice of Government (ICEGOV2012), hosted by CTG in Albany. Pictured: Yefei HU, PAD student visiting from Fudan University; Dean Hill, PAD student and Open Projects Manager, NYS Senate; and Nigel Shadboldt, co-founder, Open Data Institute. 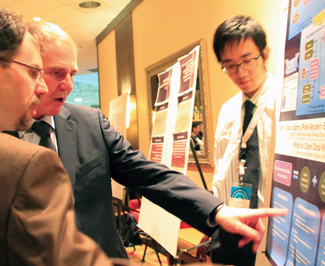 The fall 2012 offering of the course provided a unique opportunity for the students to share their work with the attendees of the ICEGOV 2012 (International Conference on Theory and Practice of Electronic Governance) conference organized by CTG and held in Albany. Students planned and prepared a joint paper, which provided an in-depth look at the variety of perspectives on the open data movement and its implementation in different governments and cultures theme. Students developed posters that presented their individual work and presented those posters as part of the ICEGOV Conference Poster Session.